A full summary of all Saturday's Scottish Cup fourth round ties. 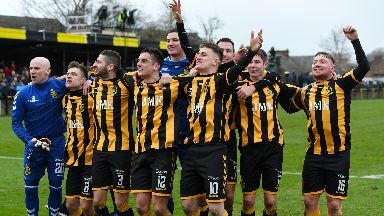 Junior Cup holders Auchinleck Talbot pulled off a Scottish Cup upset as they knocked out Championship high-fliers Ayr United. The semi-pro side went toe to toe with United and had a first-half goal disallowed for offside but saw their opponents enjoy the majority of the ball at Beechwood. Ian McCall's side couldn't get the goal they needed to settle their nerves and were stunned late on when former United player Craig McCracken found space in the box with 12 minutes left and headed home the only goal of the game. Aberdeen looked set to move into Sunday's draw when returning loanee Max Lowe put the Dons ahead after 21 minutes. But Derek McInnes' side failed to capitalise and midway through the second half they were punished when Mark McGuigan headed in from a Morgyn Neil cross. The League One outfit held on to clinch a huge result and set up a replay at Ochilview on January 29. Dundee's main priority is moving from the foot of the Premiership table but they face a replay to decide if they'll enjoy a morale-boosting cup run. Prolific goalscorer Stephen Dobbie put the visitors ahead after half an hour but the Dark Blues fought back to level just before the break with Jesse Curran getting the goal. The second half didn't bring a winner for either side and they'll go again at Palmerston Park to see who progresses. Hibs took their place in the fifth round draw with relative ease as they swept aside Elgin City at Easter Road. Florian Kamberi set his side on the road to victory with a goal after 21 minutes but later saw a penalty saved. Daryl Horgan scored the second, heading in a Vykintas Slivka cross and Stephen Mallan scored from the spot just before half-time. Horgan scored his second of the game after 53 minutes to complete the scoring and Neil Lennon's side cruised through to the final whistle sure of progress. Kilmarnock saw off lower league opposition to move into the next round but weren't at their best as they defeated Forfar. Stuart Findlay scored a stunning volley to put the hosts ahead, finding the top right corner from outside the box. But the League One side continued to compete and furstrated Steve Clarke's side until the 78th minute when Mikael Ndjoli set up for Chris Burke to finish. Last season's beaten finalists Motherwell were dumped out by Championship leaders Ross County at Fir Park. The first half was goalless but after the break it was County who made an impact. Brian Graham netted in the 52nd and 60th minute, set up by Declan McManus on both occasions. Motherwell pushed to get back into the game but only had Jake Hastie's 91st minute goal as consolation as County went into Sunday's draw. St Johnstone scored early at McDiarmid Park and didn't look back as they came out on top of the all-Premiership tie. Jason Kerr headed home in the first minute and 26 minutes later Tony Watt doubled their lead, pouncing on the rebound from Ross Callachan's shot. Accies' poor cup record continues and they exit the competition at this stage for the fourth time in five years. St Mirren produced a remarkable comeback in Paisley to take their place in the last 16. Alan Trouten had put Alloa in front in the 26th minute and moments later St Mirren were down to ten men. Brad Lyons was shown a second yellow card for an alleged dive, having been booked ten minutes earlier. The Championship side pressed home their advantage and were two goals to the good by the 34th minute when Kevin Cawley got on the scoresheet. St Mirren looked to be down and out until Cody Cooke pulled a goal back with just over 20 minutes to go. In the 85th minute, 17-year-old Ethan Erhahon levelled and then Kyle McAllister, who has just rejoined the club on loan, scored the winner with just three minutes to go. Celtic cruised to a 3-0 win as they began their defence of the Scottish Cup. Scott Sinclair missed a first-half penalty before scoring twice and Timothy Weah, introduced from the bench for his debut, wrapped up the scoring with a clever finish.